This may strike some of you as being a bit bizarre, but you just might be surprised! For non-fans of duhat (java plum), it’s the initial reaction of tannins on the tongue that often turns people off. They can’t get past that experience to the sweetness of the underlying fruit. Plus a lot of folks seem to dislike working their way around the pit either… A duhat shake is a great way to enjoy the fruit sans pits and with the tannins subdued by a whirl with some sugar. And look at that spectacular color! I thought smushing the fruit as one might pit an olive would work nicely, but actually, the easiest way to remove the skin and meat is to use a small paring knife and curl it around the pit. 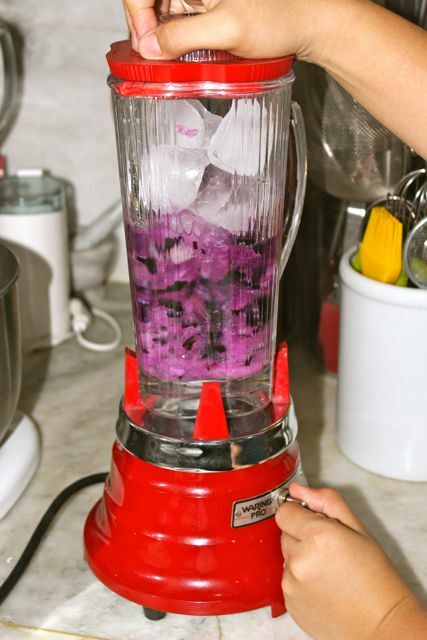 Place the meats and skins of some 20 large duhat into a blender, add some simple syrup (sugar and water dissolved over heat and allowed to cool), some water and some ice. Err on adding too little simply syrup at first, you can always add more later. You want the slight sweetness, but not so much sugar you overwhelm the flavor of the duhat. 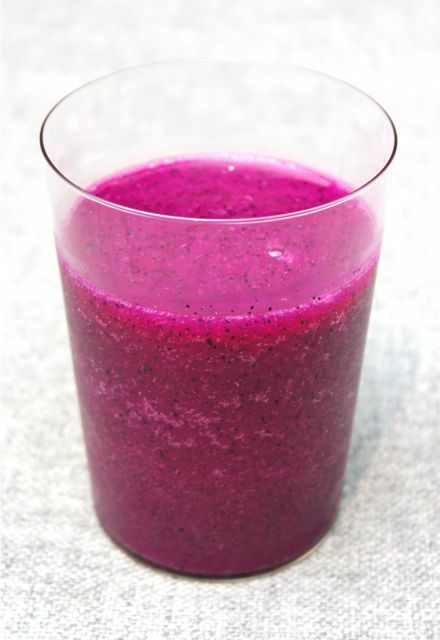 …keep blitzing until the skins are very fine, and the shake smooth. Taste and adjust sweetness if necessary. We all had a little taste of the duhat shake. 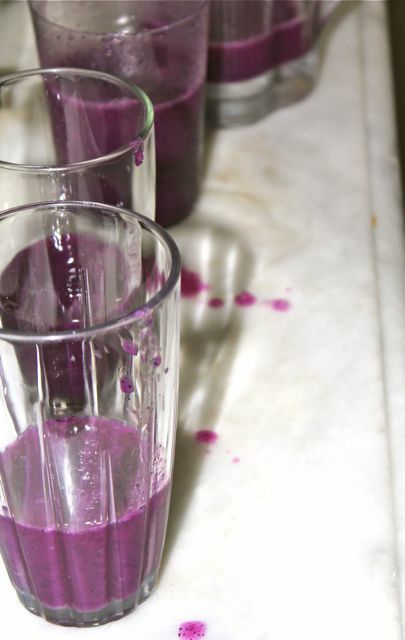 Two-thirds of us were sure it would be unpalatable, and that the tannins would be worse after the whirl in the blender. It wasn’t. The shake was a smash as far as I am concerned. The distinct flavor of duhat was present, just a little hint of the tannins, a nice sweetness from the pulp of the fruit and the simple syrup, and a spectacular color. 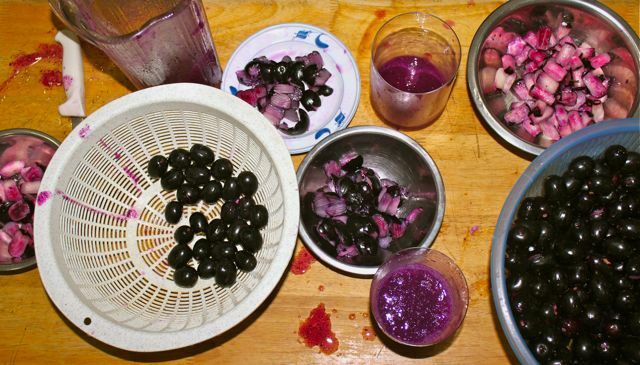 I suppose you can adjust the amount of fruit and the intensity of the color would change… The pigments in duhat skins stain, so be careful when handling the fruit. So tannic would be the english translation of “pakla”? Been trying to figure that out for the longest time haha. i take back all that i’ve said and thought against duhat, and am willing to give duhat a second chance, after seeing that wonderful color! promise, no aphud in the shake? lovely color and one of my favorite fruits. Must remember when it’s in season. Color alone is so magnifico…Someone should get into exporting Duhat! You’ll see Duhat at Dean & Deluca! Since your in an experimenting mood Sir Marketman, how about a duhat ice cream. my comment is off topic but i just want to say thanks a lot for the ube halaya recipe you posted here in this site. i can’t seem to comment in that post so here i am. :) i have been experimenting on my ube cake recipe and struggled with the consistency of halaya. the usual recipe seen in the internet are for the dessert ube halaya you eat on its own but not the good halaya to use as a filling for the ube cake. cake fillings should be “jammy” as to consistency and you got it right! i just finished my best halaya today but i added eggs as well for more flavor. :) thanks a lot again!!! absolutely stunning! :) Who would have thought – the lowly duhat turning out to be a stunner! Astounding color. What would you call that shade of violet? That’s sure to go over well with us. We are the people who like purple. @march, not quite off topic, same hue. Looks like kiwi shake, just in different color! I love your experiments, they open my eyes to a lot of possibilities. Duhat shake, I would never have thought of that! I love that color too, it’s an eye catcher. Hmmmn, do you think duhat margarita would work? The color makes a great presentation, and salt works well with duhat:) If you serve this in a party would it knock everybody’s socks off? 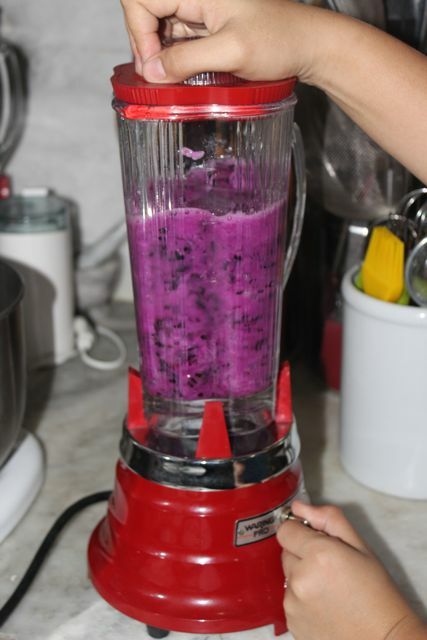 Maybe a food mill will work in taking the skins off and then blitz the pulp in the blender. Since duhat stains, could it also be a good natural food coloring? Brilliant! I personally like the slightly astringent taste of duhat. There might be a cocktail recipe waiting to be discovered here. How exotic! @ anonymous paul. Another synomym/translation for ‘pakla’ would be astringent. The color and texture of duhat remind me of blueberry. What do you think of duhat muffin? once, my brother’s friend gave us seedless duhat! maliliit nga lang yung duhat but it was fun to eat. MM, the duhat shake could be mixed with tequilla and transformed into “duhat margarita” served in a glass with it’s rim coated with salted! 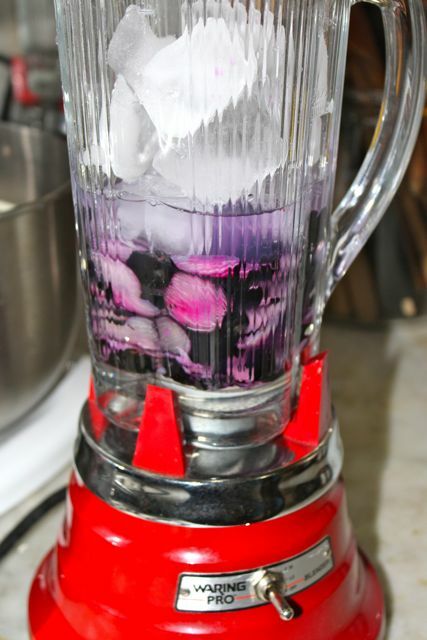 @MrsFroggie, splendid idea, specially after straining and rather ohohsevenish too… blended, not shaken. MM, you KNOW I would absolutely LOOOOVE that color, right? :-D Just stunning!!! And as for turning duhat into shake, I was sure it would turn out well. I’ve said before that we should experiment more with local fruits, and shakes are one of the easiest and safest ways to do so. It still baffles me why, after years of Cafe Bola serving delicious camias, chico and caimito shakes, still almost nobody else is doing the same. They’re all delicious, with the caimito one being my favorite! 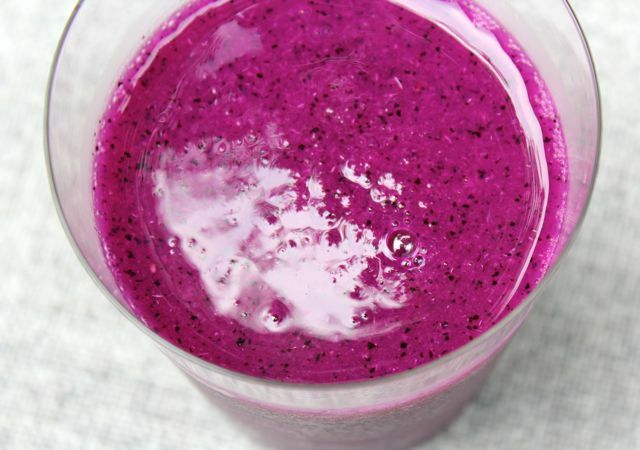 I think you made a smoothie rather than a shake. Wish I could try it. Is is true…duhat is good for diabetics daw?! Would be delighted to see this at Zubuchon. I bet it would be a hit. A “seasonal” drink. If I remember correctly, I first encountered the idea of a seasonal menu which changed depending on what produce was available for the season (or even for the day) when I read up on Alice Waters and Chez Panisse. BTW, is there an English name for Duhat/Lumboy? fruit “violently shaken” … hahaha – if we can only do the same to some politicians! A few years ago I saw duhat wine being sold at one of the posh Makati hotels (can’t remember which one). How I wish I bought a bottle. Care for making wine from your excess duhat? Mike, yes, they do make duhat wine… I haven’t tried it though. 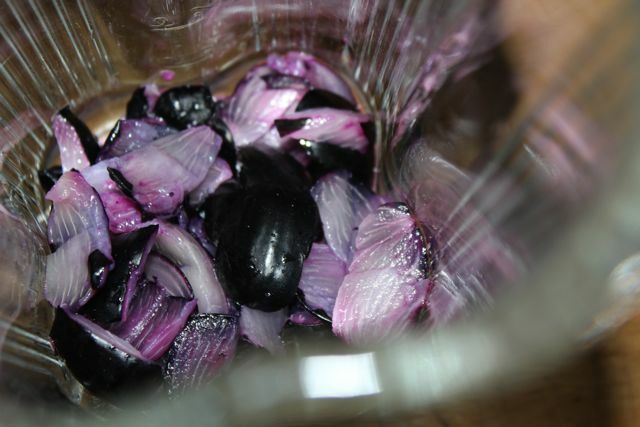 What I have tried is “balsamic” duhat vinegar, several years ago, and that was quite nice. I can imagine this as a very nice homemade Popsicle! Serendipity! My daughter picked some duhat from our tree this morning. And a few hours later I read this while going through your old posts. Tried it. Liked it. Thanks MM!